This story has been drawn from the August issue of the American Reader. G enters the unoccupied cottage. Porridge, chairs, beds. Too hot, too cold, too high, too wide, too hard, too soft. Just right. G eats, breaks, crawls in. The owners return. An intruder! G, wildflower picker, enters the snug little cottage in the woods, knowing or not knowing whose it is, the owners absent as if by arrangement. Three pots of porridge, three chairs, three beds. Too hot, too cold, too high, too wide, too hard, too soft. Just right. The rule of three. G eats, breaks, crawls in. The owners return. There has been an intruder! G, restless by nature, is picking wildflowers and chasing butterflies in the woods when, in a particularly lonely spot, she comes upon a snug little cottage. She may or may not know whose it is (there are stories). She peeps through the keyhole. The owners seem conveniently to be away, so she enters. There are three pots of porridge on the table, set out to cool. She tastes them: too hot, too cold, just right (she eats it up). There are three chairs. She sits on them: too high, too wide, just right (she breaks it). She is sleepy. Upstairs, there are three beds. She tries them: too hard, too soft, just right (she crawls in). The owners return. There has been an intruder! They have expected this. G, restless butterfly chaser, enters the little cottage in the woods, probably knowing whose it is (there are stories), the owners absent as if by arrangement. Pots of porridge, chairs, beds. Too hot, too cold, too high, too wide, too hard, too soft. Just right. The rule of three. G eats, breaks, crawls in. The owners return. The intruder they have anticipated has arrived. G enters the unoccupied cottage. Porridge, chairs, beds. Too hot, cold, high, wide, hard, soft. Just right. G eats, breaks, crawls in. The owners return. An intruder. But where is she now? She is in the kitchen of the snug little cottage she has come upon in the woods, lifting the lids of the three porridge pots on the table, each in a primary color as if there were some rule about it. She does not know whose cottage it is, but while picking flowers she has seen a family of wild things and supposes it must be theirs. Was it improper to intrude upon their home while they are away? Or are they away so that she might intrude? G has read and been read stories about such cottages and their beastly occupants and has been guided by them, and is guided by them now as she tastes the pots of porridge with wooden spoons to test their temperature. One too hot, the next too cold, the little one just right. She probes the meaning of this and believes she sees it, and she knows now what will follow. There will be chairs—there are chairs!—and beds and rude awakenings. She picks up the smallest chair, excited by the wild things’ smell, and dances with it, imagining other dances yet to come. The B family is also dancing, B1 and B2 slowly rising and falling from foot to foot, B3 leaping with abandon, exhibiting his youthful virtuosity. They have seen G passing by, her eyes lit with exhilarated anticipation, wildflowers in her golden hair, and they, too, have felt the exhilaration. While the other two chatter excitedly about what they will find and do when they return, B1 ruminates about past intrusions, other little butterfly chasers and thieving old crones and, in the storied days when there were only bears and foxes in the world, the mischievous vixens. Mostly, though, he thinks about the restless golden-haired girls, and he lifts one foot and then the other. B2 also remembers them. Indeed, the cottage is haunted by their fleeting presences. Somebody has been sleeping in my bed: something she will say and hear again today. B3 says he wants to eat this one. It is against the rules, B2 says. All the more reason, B3 says, and bounces about, gleefully trampling wildflowers and scattering butterflies. Watching him, B1 supposes he himself must have been like that once upon a time, and hops a wistful hop. Someone has been tasting my porridge! …tasting my porridge! …my porridge! Someone has been sitting in my chair! …sitting in my chair! …in my chair! G, tucked in, listens to the wild things recite their lines as they emerge from the brambly woods and march three times around the cottage (the rule of three! ), repeating the words precisely, though in their different voices, each just a step behind the other as in a childish round. The leader has a rumbly old voice, deep and growly, and the followers, too, have growly voices, though not so deep. Someone has been lying in my bed! …lying in my bed! …in my bed! She is that someone, curled up under the coverlet in the smallest one, the one just right, knowing what ought to happen next, not knowing if it will. It is very exciting and she is determined not to fall asleep, but she does, as if overtaken suddenly by a spell. Someone has been tasting my porridge! …tasting my porridge! …my porridge! B3 knows he is the unlucky one, his porridge will be eaten, his chair broken, his bed invaded, but though the grip of the past on the present is fierce, variations can happen. It would earn him a fearful cuffing, but new endings can be imagined, old rhythms broken. He has seen her. A tidbit, but succulent. Someone has been sitting in my chair! …in my chair! …my chair! B3, B2 believes, is suffering from the delusions of the young, unable to see that change itself is changeless, new rhythms mere resortings of the old. For what has not been imagined and, imagined, done? She has no sympathy, however, for the intruder. In the past, such creatures were impaled on church steeples, and she would not mind if they did that now. B1, leading them around the cottage on their final turn with his deep rumble, would agree with B2 about change, but he knows that the illusion of changeability generates desire, and the tender agitation of desire is what makes life possible. See B3 now, bouncing about, gleefully leaping and laughing. Of course, there is also the inescapable conflict of desires… Someone has been lying in my bed! …in my bed! …in my bed! Their ceremonial march completed, they enter the cottage. Lying sound asleep in the little cottage’s littlest bed, the one just right, G has a dream of dancing with the wild things. She is wearing no clothes because she is also a wild thing. They recognize her as one of their own, and they love her and share their porridge with her, and she loves them. She dances with each of them in turn and, one by one, laughing joyfully, they lift her high and set her gently down again. She feels like a beautiful princess, princess of the wild things, lifted up to be adored. And then one of them does not lower her, but continues to hold her high, so high she can see the roof of the cottage and the tops of the trees, and she is suddenly frightened and begs to be let down, but they are only laughing in their rude barking way somewhere far below. She is falling! She wakes. Where is she? The intruder’s exciting smell is everywhere, but they know where to find her. B3, hopping about like his tail is on fire, wants to leap straight to the finale, but B1 insists on adherence to form, starting with the telltale wooden spoons standing in the porridge pots, though he agrees to hurry along, his ponderous obduracy scarcely concealing his own agitation. They rush trillingly through the porridge tasting and chair sitting, B3 bouncing back and forth impatiently, B2 standing stolidly in the middle, performing as obliged, but minimally, without ornament, and then B3 sings out (he is already bounding up the stairs, B1 and B2 on his heels): Somebody has been sitting in my chair, and has broken it all to pieces! In their bedroom, they sniff briefly at their coverlets (arousing! dangerous! delicious!) but skip the recitations to gather around the bed of the sleeping golden-haired intruder. Slowly, as her eyes open, their faces break into broad toothy smiles. She wakes. Where is she? She remembers entering the cottage of the wild things, as if invited, and sampling porridge, chairs, beds—but was it all a dream? No, there they are, leaning hugely over her, showing all their teeth. Someone has been lying… lying… lying…, they growl, …in my bed! …bed! …bed! The biggest one with the deep gruff voice has been leading them, but now it is the smallest who goes first. And here she IS! …IS! …IS! Then they all laugh uproariously, but it is not a very nice laugh, more like ferocious barking. She smiles hopefully, pulling the coverlet up to her chin, and the wild things commence to shuffle slowly, ceremonially, around the bed. She would be encouraged by this dance, if that is what it is, were it not for the savage glitter in their eyes. She recalls now her dream of dancing with them. Something bad happened. Does she have any clothes on? G was so happy when she discovered the wild things’ cottage. It was like a story coming true. After the obligatory peek through the keyhole, she had entered and found everything just as she had imagined: porridge, chairs, and beds, three of each, following the rule. So, joyfully—G is the very essence of joy—she did all she was supposed to do, eagerly awaiting the adventure to follow. It was very exciting, even their smell was exciting. To crawl into their beds was like crawling into a warm cave in the forest. What a surprise when they lift the coverlet! She knew of course what usually happens. She has seen the open window. But this time, she believed, would be different. This time she would stay to see what happens next. Perhaps, however, she thinks now, soaring naked through the pungent air, the stories misled her. She believed the wild things would be just like her. They are not. The intruder is passed from hand to hand, sometimes pinched, sometimes caressed, sometimes tossed or swung by her ankles, each gesture repeated three times (the rule), B1 leading, the others following. She is making an undefinable squealing sound—of joy perhaps, or terror—that adds to their pleasure. Even B3 agrees this is better than eating her, though that option is still on the table, so to speak. We should fatten her up first, B2 says. Fatten her up, fatten her up, the others say. She is such a thin hairless little thing, there is scarcely a bite each. Scarcely a bite, scarcely a bite. Hairless, yes, except for her golden strands which weave beautiful patterns in the air as she is flung about, patterns that express the family’s delight in having an intruder to play with. And there are many more games they can play. B3 will not be allowed to spoil their fun with too hasty a finale. She is hanging by her feet from a rafter above the B family’s beds, where they lie resting after their joyful exertions, eating their cold porridge and reflecting upon the games they have played thus far and imagining those to follow. Above them, her golden strands waft silkily in the breeze from the open window, the last of the entangled wildflowers dropping decoratively upon their coverlets. When the intruder pulls herself up to look around (there is no place to go, she drops back down), B1 watches her with delight, B2 dismissively, B3 with conflicting desires. G, inverted, looks out upon a world turned upside down. The wild things lie stretched out on their beds below her, watching her, growling amiably from time to time. The burly one has finished his porridge, the middle one is eating hers, but the littlest one, who seems the most dangerous (while she was being thrown about, he pinched her all over, as if testing the amount of meat on her bones), has had to do without. Just look at the little bushytailed vixen, the big one says. Takes me back to the old days. I will save her hair and make something nice with it, says the middle one. With garlic, wild thyme, and forest mushrooms, the littlest one mutters ominously to himself, licking his hairy chops. G again has an inverted view of the world, as the wild things joyfully sweep the cottage with her golden locks, passing her rhythmically from hand to hand, her head wheeling dizzyingly within a hair, as one might say, of the floor. Cleaning house is our great delight! …delight! …delight! they chant, led by the largest of them as they whisk her about, the others following. G is too terrified even to scream, she can only grit her teeth and stare straight ahead as the floor flies by, thinking, not for the first time, that perhaps it was a mistake to come here. We searched for a broom and this one is just right! …just right! …just right! The middle one sweeps her under the table and dusts off the top, and the little one deftly brushes spider webs out of the corners with her. The big one flicks her locks at the bats in the rafters, then gives her a little shake to make the dust fly. G sneezes, causing her head to bounce off the floor, and the wild things laugh their growly laugh. Just right! …just right! …just right! G is slowly rising and falling, rising and falling, as if caught in some endless loop, one no longer wholly related to the wild things who, except for their hands, may not even be there. Her motion is not entirely continuous, but momentarily stops at the bottom of each fall when she is caught and held in those hairy hands (it feels like a kind of punctuation), before she slowly floats up toward the rafters again. So precise are the repetitions of this stuttery cycle that it feels fixed and static even in its constant motion, and it provokes a curious feeling in her not unlike panic. Let me out! she is screaming, or believes herself to be screaming, though she rises and falls in silence. Yet someone must have heard her, for suddenly she is flying across the room toward the open window. Escape! Her head passes through it but she feels a pull from behind, and she flies back into the hairy hands. Again and again she flies toward and through the window and is sucked back. It is as if the house has been tipped on its side and she is still rising and falling. Faster and faster she flies back and forth (or up and down) until, just as she leaves the cottage altogether (at last! ), all illusion of motion ceases and she wakes to find herself stretched out on the kitchen tabletop where the porridge pots once stood, an apple in her mouth, the grinning wild things hovering menacingly above her. The intruder, recovering from the blow she took when she sneezed her head against the floor, sits up on the edge of the table, still biting the apple and staring in terror at the three of them crowding around her in their large friendly way. Perhaps she will try to run away and they can have a game of chase, B3 is thinking with pleasure, flexing his claws. The pallor of her hairless body is now besmudged and her golden hair is full of spiders, an improvement in B3’s opinion, though she still has a strange alien smell, which he likens to that of pond water. Though their games are a great delight for the whole family, B3 believes they belong to a bygone time and wants an end of them. He is already imagining a supper of roast intruder with a honey glaze. But B1 insists on more games. Several are proposed such as “Golden Cat’s Cradle” and “Pin the Tail on the Intruder,” but B1 says he was thinking of something more traditional like “Bears and Vixens.” B2 picks up a porridge pot and smashes it furiously against the wall. G, restless butterfly chaser… chaser! …chaser! …chaser! enters the little cottage in the lonely woods… woods! …woods! …woods! Too big, too small, too rigorous, too frivolous, too hairless, too hairy… hairy! …hairy! …hairy! Too empty, too full, too sharp, too dull, too funny, too scary—…scary! …scary! …scary! The cottage kitchen has fallen silent with the shattering of the porridge pot. They stare down melancholically at the scattered shards. It is as though some of the fun they were having was in that pot, and now it lies in ruins. And was it really fun, or only a desperate effort to stave off the emptiness? The pale intruder, sitting on the table’s edge, takes the apple out of her mouth and says timidly: I want to go home. B1 can only shake his head and grin his sad toothy grin. B3 angrily smashes his pot against the wall. B2 and B3 have led, but B1 does not follow. He announces solemnly that the intruder must be washed and dressed for the games yet to be played. G, restless wildflower picker… restless! …restless! …restless! 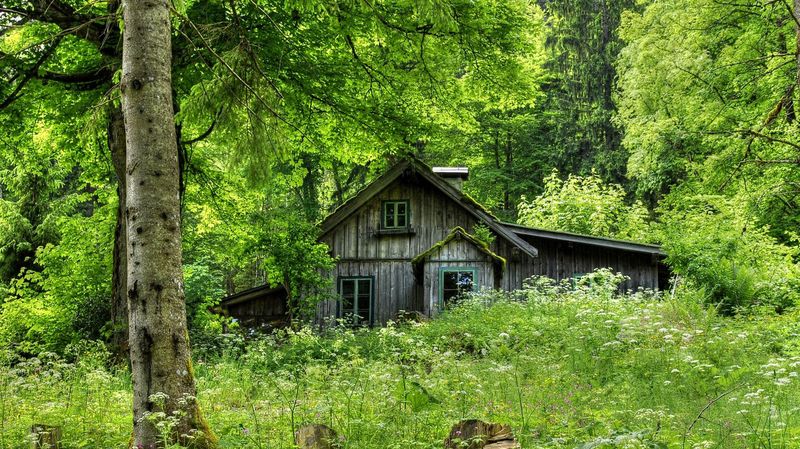 enters the cottage in the lonely woods… lonely! …lonely! …lonely! Too big, too small, too happy, too sad, too dark, too bright… bright! …bright! …bright! Too empty, too full, too sharp, too dull, too wild—…just right! …just right! …just right! With an overture blast from B3’s toy trumpet, the intruder glides over the table, her feet grazing the surface. When she stops, her feet swing. She wears a pinafore and cape and carries a basket of wildflowers. Her knees dip and, though her free hand hangs loosely at her side, her skirt rises in a discreet curtsy. Her audience growls and hisses. Too nice! When the intruder next appears, heralded again by the tin trumpet, her face has been garishly painted, her golden locks stand spikily, her pinafore halter is filled out with apples. She kicks her legs high and shakes her little hips, then pivots, bends over, and, though her hands dangle, her skirt flips up. What is revealed is brightly rouged. Barking laughter, growling. Too naughty! Again heralded, the golden-haired intruder, carrying a basket of wildflowers, glides over the kitchen table, her feet swinging. Her face paint is smeared with tears. She wears only the cape and under it a bushy red tail, which she swishes back and forth with a discreet shaking of her pale hairless hips. B2 and B3 bump their paws together in jubilant applause. Just right! While the largest one dresses her again in her tattered resewn pinafore, tugs her stockings on, and reattaches all her silken cords, he leads the others in another round of exuberant chanting. In overlapping voices, they describe a restless girl with golden hair picking wildflowers and chasing butterflies, who enters a lonely cottage without permission, eats someone’s porridge, breaks a chair, crawls into someone’s bed, and has a rude awakening. With each phrase’s repetition, decorated with their toothy grins and punctuated by cruel barking laughter, the chant grows ever more frightening. Whatever happened to that open window? She wishes she were back in her own house again, but doubts she is in a story where wishes are granted. Someone has been… has been… has been… sleeping in my… in my… in my… bed and here she… here she… here she… IS! …IS! …IS! A basket of wildflowers is attached to her wrist and she is lifted by her strings to be suspended over the kitchen table. Her audience’s eyes glitter with anticipation. To stay at home is too dull. To dance with the wild things is too terrifying. Is anything just right? Announced by the tin trumpet, the girl in the pinafore glides over the table, feet swinging, basket of wildflowers on her arm. She is the very expression of innocence. But she is not innocent. She is the restless intruder. She appears to pick up a bowl of porridge with her hands and knees. She lifts it to her mouth, leans back, knees high: she is bathed in porridge. There are muttered accusations, but also rude barks of laughter. The smallest one jumps on the table to lick her clean but is swatted away by the puppeteer. A chair appears. She is seated upon it. Nothing happens. She is lifted and dropped back onto it. Nothing happens. She is lifted toward the rafters. She screams. They laugh. She drops, hammering it hard enough this time to splinter it. More ritual mutterings, barks. Strings are pulled and her clothing flies away, leaving her dressed in her golden hair. Traces of rouge remain, but no sign now of divine resplendence or demonic powers. The puppeteer gathers her up and moves toward the stairs. When the others follow, he turns and snarls at them. Resentful grumblings. G dreamt of dancing with the wild things. She has done so. It has not been as she imagined. In another story, they might all have been beautiful princes in animal skins. But she is in this one, on her way up the stairs in the hairy arms of a huge wheezing beast, bound in a tangle of silken cords. She has been soundly punished, but there is evidently more to come. The rule of three. He calls her his bushytailed little vixen. Somewhere in the cottage can be heard the explosive smashing of porridge pots. In the kitchen, B3 is preparing a sauce robert, which he says is the perfect accompaniment for roast intruder—chopped onions cooked in butter with a reduction of white wine and pepper, an addition of demi-glace, finished with mustard—but he cannot find the mustard. She who daily boils the porridge, keeps the sitting room clean, and makes their beds, resentfully kicks the pot shards aside and shows him where it can be found. She has already prepared the demi-glace, a honey glaze as well. She will teach the wicked little intruder what is just right. B1, in bed with the golden-haired intruder, muses melancholically upon time’s signature betrayal: It promises and it withdraws its promises. He dreams of happy endings, but the story he is in, which is every creature’s story, must do without. Raising voices against it is of no avail. The consequence is a despair that invites the very ending one is seeking in vain to avoid. G, too, lying in the wild thing’s densely fragrant bed, once dreamt of happy endings. Now, however, a dismaying aroma of cooking onions rises from below, where, in the kitchen, B3 stirs in the demi-glace, his only interest in time’s passage being that required for his sauce’s preparation. B2 does think about time and its betrayals, but only as something not worth thinking about. B1 believes that life, to be lived at all, must first be invented. He therefore attempted every imaginable variation of the puppeteer’s art, a veritable compendium—firmly based in tradition—of innovative virtuosities. He thought of it as a brave attempt to hold despair at bay by, if not staying time, at least stretching it. But time’s burly motions, alas, are singular and implacable. To hold the intruder’s pond-water smell at bay, B3 stretches his sauce robert with honeyed milk, richly spiced, which B2 recognizes as an innovative touch. She herself is more traditional in her cooking, uninterested in innovation or in virtuosity either, though she respects B3’s youthful appetite for the new. An appetite that G once shared, though—having been well punished for it—no longer. B1’s final puppet act was an abject failure. He attempted, pulling on her silken cords, to settle the little marionette into a useful position on the bed—namely, that of the pinned butterfly—but the strings were hopelessly entangled, his fingers too clumsy to undo the knots. In the end, he had to abandon his loftier ambitions and resort to a pair of scissors. B2 keeps scissors handy, intending to make something useful from the intruder’s locks. Silken doilies for their chairs maybe, her own area of virtuosity and invention. The locks’ owner, though her bonds have been cut, still feels hopelessly pinned. Is there no escape? Perhaps. B1 may have enjoyed his maniacal finale, B3 is thinking, but his own ambition is to play one game more. G’s punishment for being a restless intruder is over. She is herself a wild thing now; she is even beginning to smell like one. The puppeteer has fallen asleep. From below: the clatter of pans, cooking aromas. She has been left alone, unwatched. Is she brave enough to jump from up here? She is. The wild thing’s thunderous snore will cover any move she makes. She slips out of his bed, uncertain hope returning. But the window is tightly shut. She has been crying, she is crying again. The littlest wild thing, who is nonetheless much larger than she, enters stealthily and opens the window. He has knotted some sheets together so that she need not jump. She has misjudged him and is grateful and would say so, but his hairy hands are pushing her out the window. She descends hastily and sets off running through the woods. The rocks and roots hurt her bare feet, the brambles tear at her skin, but she is too exhilarated to care. Free at last! She pauses to catch her breath. She can hear footsteps crashing through the undergrowth. Oh no! Someone is chasing her! B3, much faster than the barefoot intruder and knowing the woods as she does not, is able to bound ahead of her or race from one side or the other, thus forcing her to change directions over and over until she is lost and crying out. He is tempted to do with her as B1 did, but is enjoying too much the overlapping chase. B1 is watching this madcap frolic from the upstairs window. When he woke to find the little vixen missing and the window open, he felt at first alarm, then wistfully happy. She had helped him rebound from the onset of despair. Let her go. Now he sees the game that B3 is playing. If he brings her back, that will also make him happy. As G runs frantically through the woods, now in one direction, now another, she feels pursued by a dozen wild things, coming at her from all sides. Her feelings of exhilaration have evaporated. She has had strange nightmares of being treed by baying dogs. Perhaps this is another, she thinks, tears streaming down her cheeks. Perhaps she is still in the big one’s bed. Bounding joyfully, B3 is in effect encircling her, driving her back toward their cottage. She is getting scratched as she races through the brambly woods, appetizing crimson droplets appearing on her hairless flanks. Sometimes he lets her run awhile, imagining escape, before closing in on her again. Making the panicky creature run before cooking her, he knows, will add to her wild spicy flavor. B2 watches B3’s extravaganza from the kitchen window, admiring his leaps and bounds and laughing at the intruder’s distant cries. B1 let her go, obeying tradition; B3 is changing it. She chops up nuts and dried fruits for dessert, stirs the sauce with a wooden spoon. A spider falls from the rafters into the sauce like a kind of punctuation. She stirs it in. G can run no more. She crouches in the hollow of a tree, stinging all over, her breath coming in sobbing gasps. The littlest one, laughing, picks her up by the nape and holds her high, swats her just for fun. He has been toying with her as a cat toys with a crippled mouse. G feels like the punchline of a bad joke. With playful pokes and pinches, B3, wishing the chasing game could have gone on longer, prods the forlorn intruder toward the cottage where the others await with forks and knives, old B1 in his nightcap, B2 in her apron. Someone has been tasting my porridge! …tasting my porridge! they sing, dancing a rocking cadence from foot to foot, rising and falling. Someone has been sitting in my chair! …sitting in my chair! B3 proudly lifts his trophy by her hair. The others show their teeth and clack their forks and knives together, continuing their stately round. Someone has been lying in my bed! …lying in my bed! B3 lowers the intruder to the ground where she collapses like an unstrung marionette, then lifts her high by her ankles. B1 sets one of his big porridge pots beneath her dangling head. Too long! …too long! …too long! they chant, led by B3. B2 steps forward with a pair of scissors. Snip! snip! snip! The locks are gone, become a potful of golden threads for B2’s art, the intruder’s head now as hairless as the rest of her. Just right! Just right! Just right! G, sheared, listens to the mocking barks of the wild things as they carry her into the cottage, wondering if it always ended this way. Maybe there never was an open window, but no one wanted to say so. A kind of gentle lie meant to ease fears of the inevitable. If so, she is learning about it rather late, though maybe that is always true: A long sleep, then—briefly, too late—a rude awakening. They lay her on the kitchen table, which has been set, she sees, for three. Above her, bats flutter in the rafters. It is warm. The oven must be on. She recalls the porridge, chairs, beds, and feels a wistful nostalgia for those comforting lies, but anger, too, that she had been so misled, haunted lifelong by corrupted tales told by tellers long dead. There was also of course her dangerous desire to dance with the wild things, maybe even, in some manner, to be one, which desire she thought of as entirely her own. But was that desire also a haunting of sorts? Is anything truly her own except the fate that now awaits her? The pale intruder lies limply on their kitchen table like a plucked chicken, her clipped head now the whitest part of her. They have suffered such annoyances for as long as B2 can remember, and although the others are sorry this day’s games are over, she is not. The foxes and crones of olden times were bad enough, but these naughty towheads have made criminal behavior frivolous, even permissible, at the expense of her family’s privacy and reputation. The big bad Bs. Well, watch out, they shall be so. B1, whose cheerful mood is giving way to melancholy, his roars of laughter increasingly hollow, is less inclined to dismiss the restless golden-haired girls as mere nuisances. Admittedly, he has enjoyed their visits in ways the others have not, but they bring, if nothing else, consoling illusions, pretty markers to decorate the passing days, otherwise leaden and meaningless. His leadership usurped, he watches B3 bound about the kitchen, full of himself, devoted, not to harmony, but to its disruption. Perhaps, B1 thinks, he shall yet find an open window, disrupt the disruption. B3, grinning toothily, dips a basting brush in the honey glaze. They are painting something sticky on her as though to mask her nakedness. Or put a gloss on it. Those brightly colored porridge pots they smashed were beautiful, as once was she. But broken shards are beautiful too, and they can hurt. Perhaps they have done her a favor. Her golden locks defined her; now she is free to seek new definitions. Maybe she can even, with what time remains, realize her old desire. She sits up on the table, crosses her legs under her, peers into their beady eyes. The wild things. They seem to be laughing at her. They shouldn’t do that. She springs into a crouch, snatches up a scalpel and a carving knife, bares her teeth and snarls. Ruff! huff! huff! they bark, bumping their paws together. They think she is entertaining them. She uses her hind paws, as she thinks of them, to kick the dishes off the table, sends the pot of sticky stuff flying, and with an audacious swing of the scalpel knocks the saucepan off the stove. Their laughter ends. The littlest one, growling menacingly, reaches for her with his paw; she stabs it. Q. Ecstatic moment. G has become a wild thing. Why? The mere desire to be weird? A. It was weird to come here, but she has no choice now, nothing to lose. Q. B3, bleeding, roars in pain and fury. The bald intruder smirks. Will no one retaliate? A. B2 retaliates, leaps upon the table, lashes out at the intruder, who dances away, laughing. Q. G is such a scrawny sprite. What chance has she against three big wild things? A. She supposes, though she is nimble, none at all. Unless she finds an open window. Q. G clings thus to the myth of the open window. Can anyone save her now? A. B1, reality inventor, can, but at the cost of losing forever his traditional family role. Q. B3, loathing tradition, has disrupted the family patterns, seeking fundamental change. What is his desire? A. Freedom. Power. But someone must lose theirs if he gains his. Way of the wild. Q. B2 meanwhile, swinging wildly, takes a tumble, landing below in shattered dinnerware. Who avenges her? A. B1, stifling his laughter, should, but hesitates. He has lost his appetite for roast intruder. Q. With his newfound ambivalence, has B1 also lost his credibility as the wild things’ leader? A. In the eyes of B2 and B3, he has, but G still fears him most. Q. The wild things are in disarray, their feast disrupted, the feisty intruder trapped. What next? A. Perhaps G is eaten. Perhaps B1 invents an open window. Only inexorable time will tell. Something is ending. The ecstatic moment has passed. The biggest wild thing has absented himself. The other two, growling menacingly, approach the table whereon she crouches. Someone has been tasting my porridge, declares the middle one solemnly, and the other, following some beats behind, repeats the line in an icy monotone, holding up his bandaged paw in remonstrance. G, no longer restless, can only wait for them amid the tabletop ruins of the disrupted feast, scalpel and carving knife in her fists. Someone has been sitting… …been sitting in my chair! They crawl upon the table, their huge claws unsheathed. Someone has been lying— She bangs her weapons down, interrupting their canonic litany, scoops her clipped hairs out of the porridge pot, and applies them to her sticky body, transforming herself into a golden wild thing. They snarl, back off. She grabs up more golden hairs and flings them at them. They duck and fall from the table, landing heavily, but soon climb up again, grinning their chilling grins. A faint breeze tells her that, somewhere, there is now an open window, but she also knows, alas, she could never reach it. B1 is lying in his bed upstairs, musing wistfully upon the world’s restless golden-haired girls, assuagers of time’s betrayals, key to their happiness, and musing most immediately upon the feisty but doomed intruder, misled by hope, in the kitchen below. He has opened a window for her, but surely too late. There will be other wildflower pickers and butterfly chasers, but he is saddened to lose this one: his virtuosic marionette, his mischievous little vixen. He rises, heavy of heart, and descends the stairs. She is trapped on one corner of the table, B3 closing in, B2 posted on the floor below, blocking her escape. The intruder’s audacious transformation makes him smile. From the rear she is still a pale inconsequential hairless thing, but her fuzzy chest and belly are resplendently golden. Her unnatural desire to transcend her kind has provoked, however, not a familial embrace, but murderous rage. She moves nimbly but not nimbly enough: B3 has her in his claws. B1 hoists himself upon the table, delivers a blow that sends B3 flying. Somebody has been tasting my porridge, he bellows thunderously. No reply, except for a low fierce growl. The big wild thing’s roar is met with rebellious rumbles. The others, grinning humorlessly, push him off the table: he hits the floor with a heavy grunt. G braces for the worst. B2 and B3, wielding forks, stalk the intruder. She has torn B2’s family apart and must be punished. B1 returns, sweeps them both off the table. Mad clatter of pans and dishes. G, weaponless, discovers the scissors used to shear her head. She crouches, gripping them fiercely, ready to strike, thinking of herself as a golden wild thing to keep her sinking spirits up. B3 is back, teeth clenched, growling savagely. He claws at the armed intruder, who, ducking, falls into the waiting arms of B2. B1 snatches her away before a bite can be taken. The puppeteer’s tabletop stage is now the platform for a nightmarish dance of punching, kicking, clawing wild things, G caught in the middle. This is fun! she tells her disbelieving self, weeping. B1, astraddle the frightened intruder, beats off her attackers. B3, standing heroically against the tyrant, takes blow after blow. B2 brains B1 with a skillet. Agitated bats flutter through the kitchen, screaming. G’s scissors have been batted away. She grabs up a wooden porridge spoon, swings it wildly, misses her attackers, hits the big one instead, surprising an angry roar from him. Uh oh. A window is open. The oven is lit. The intruder may flee or be their dinner. Or perhaps (three) they will simply, fighting over her, tear her apart. Way of the wild. After dinner, the B family takes nostalgic delight in singing some of the old songs—sad songs, inspiring songs, indecently comic ones—about life’s ecstasies and time’s betrayals, about unavoidable endings, unchanging change, and the tender agitation of desire, about skinning vixens for their fur and impaling old crones on church steeples and about shearing towheaded sprites of their golden locks. They clack wooden spoons and dance ponderously yet exuberantly, belching and snorting, around the table. It is hot in the kitchen, but somewhere a window is open and a breeze is blowing. B2 is wearing a raggedy restitched pinafore on her head like a nightcap, making everybody laugh, and B3 makes rude noises with his toy trumpet. They sing about luring intruders into their cottage—“Come closer, come closer,” they growl seductively and laugh—while at the same time feeling a certain wistful nostalgia for the stories as they used to be told, the lies that made life easier. G, wildflower picker, enters the snug little cottage in the woods, knowing or not knowing whose it is, the owners absent as if by arrangement. Three bowls of porridge, three chairs, three beds. Too hot, too cold, too high, too wide, too hard, too soft. Just right. The rule of three. G eats, breaks, crawls in. The owners return. There has been an intruder! G, restless butterfly chaser, enters the little cottage in the woods, probably knowing whose it is (there are stories), the owners absent as if by arrangement. Bowls of porridge, chairs, beds. Too hot, too cold, too high, too wide, too hard, too soft. Just right. The rule of three. G eats, breaks, crawls in. The owners return. The intruder they have anticipated has arrived.